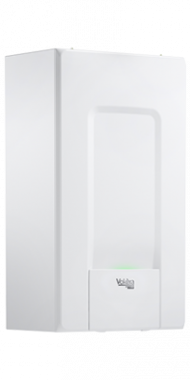 The Vokera Evolve system gas boiler is a system boiler so it directly heats your central heating system and hot water for a storage cylinder. Most of the important parts of the hot water and heating system such as the pump and expansion vessel are built in on a system boiler making it quicker and cleaner to install. It also means you get a faster response to demand for heating and hot water, plus you don't need to have a feed and expansion tank in the loft. This highly reliable boiler is a condensing wall mounted unit. It comes with a variety of features and benefits, with this unit being designed and manufactured by Vokera. This boiler is a quick and easy installation, helping to save you time and money. The boiler is able to fit in a standard sized cupboard with it being compact. This helps to save you that much-needed space in the home. This boiler features reduced emissions with ACC combustion, time clock, text driven menus, built in carbon monoxide monitor, a rear flue option and next generation plate heat exchanger so you can be sure you’ve got an easy and user-friendly boiler that is not going to let you down. This boiler is a highly reliable unit with an efficiency rating of 94% making it A rated. As well as coming with an output rating of 18kW, making the unit perfect for smaller homes with not such a high demand for heating or hot water as well as only one bathroom. This boiler has a wide range of options to help it suit any sized home. With it coming with an option of natural gas or LPG. It comes with an option of the unit being a combi boiler or a system boiler. This range of boiler comes in 8 models, 4 system and 4 combi. With these ranging from 18kW to 36kW making it ideal for any heating and hot water demand. This boiler also features ten years warranty so you can have peace of mind that you're getting a boiler that won't let you down.